The high altitude and rugged terrain in Qinghai province means that agriculturally the land can only sustain a limited array of vegetables and fruit. However, it’s the ideal place for growing barley and raising yaks, both of which thrive in the cold climate. This means that signature Qinghai dishes tend to be hearty and full of yak-based products, from yak meat to yak butter. In short, Qinghai locals are always yakking on about something! Qinghai itself is populated by a wide variety of China’s ethnic minorities, but is dominated by the Han, Hui, and Tibetan people. 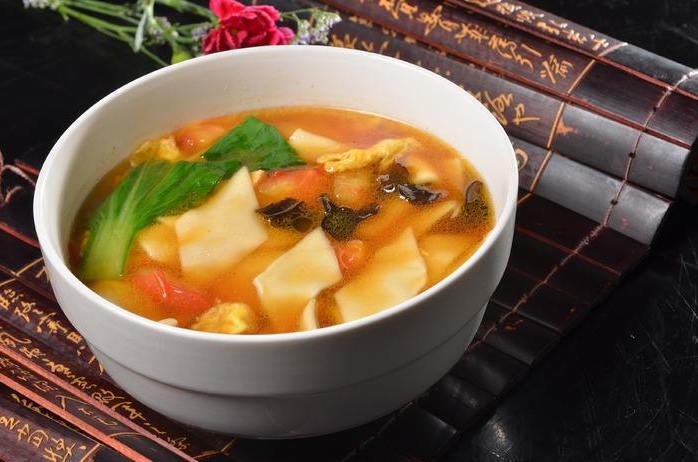 Thus Qinghai cuisine is characterised by its simplicity and sustenance, with a unique blend of Tibetan and Hui Muslim influences adding a touch of flavour to each dish. Hui-style Dumplings are so delectably plump, they appear to have been filled to the point of bursting! Unlike other types of dumpling, these tasty treats are filled with unusual, hearty ingredients such as carrot shreds or tiny cubes of potato. The meat filling is heavily seasoned with mustard seeds, cumin, cassia bark, cardamom, pepper, and sugar to give it an added burst of flavour. Different vendors will shape their dumplings in unique and captivating ways. 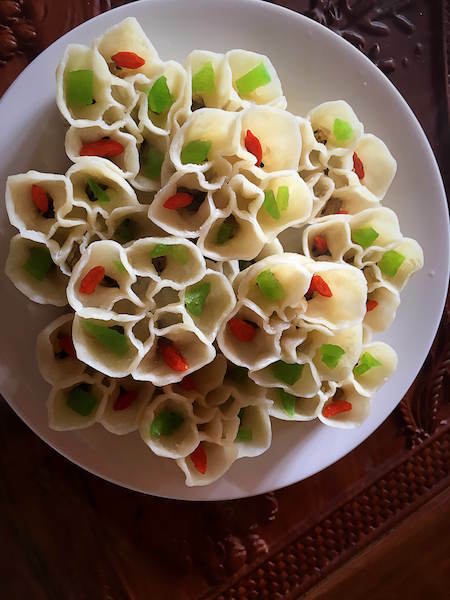 Sometimes these shapes even provide clues as to what the dumplings contain. So, if you see a little fish-shaped ball of dough, you know just what to expect! 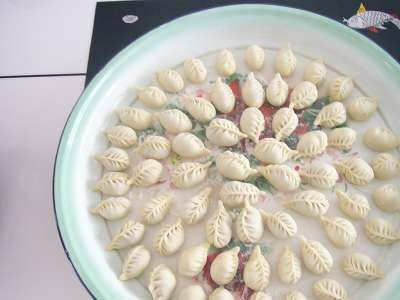 They may look small but these dumplings are very rich, so two or three is normally enough for a decent meal. 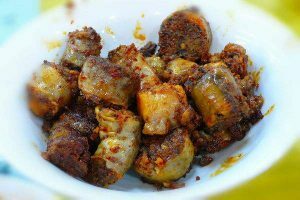 This dish is popular with several of China’s Muslim ethnic minorities throughout the regions of Xinjiang, Ningxia, Gansu, and Qinghai. Its name derives from the fact that historically it was sold on the street and, in order to eat it on the go, people would simply “grab” a piece of the mutton with their hands. That being said, be sure to pay for it first! To make the dish, a joint of mutton is first stewed for a long time, until it becomes so tender that the chops can be easily separated and the meat melts off the bone. The mutton is then chopped into small pieces and arranged on a plate, where people are free to grab a piece and dip it into their condiment of choice. It is often served simply with a sauce made from salt, crushed garlic, parsley, soy sauce, vinegar, chilli oil, and sesame paste. Variations on the sauce depend on who’s serving it, but the juicy mutton alone is enough to sate most people’s hunger. Blood Sausage may not sound like the most appetising of snacks, but its rich and mildly spicy flavour is surprisingly pleasant. Like Black Pudding in England, Blood Sausage is made using a mixture of spiced sheep’s blood and roasted barley. Another variation, known as White Sausage, contains all of the same ingredients except for the sheep’s blood. Travel to one of Qinghai’s city markets and you’re sure to come across tables full of Blood Sausage, coiled into large piles like shimmering black snakes. In restaurants, it is normally sliced into small pieces and fried on a griddle, to be served as a side dish. With its full-bodied texture and umami flavour, fried Blood Sausage makes the perfect accompaniment to any meal. This sumptuous dish is so-named for the unusual shape of its wheat noodles, which are rolled thin and then cut into tiny, diamond flag-shaped pieces before being added to a clear broth. This broth is usually flavoured using tomatoes, squash, carrots, celery, white radishes, spinach, and small pieces of mutton. The result is a light soup with a clean and refreshing taste that is perfect as a palate cleanser or to simply cool you down during the summer months!